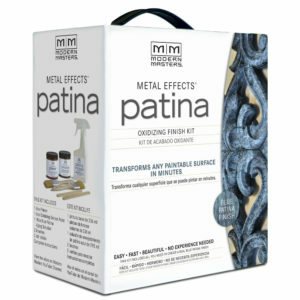 Modern Masters Metal Effects paint is a high-tech acrylic paint with genuine metal particles mixed inside this. This unique formulation means that it develops patina or rust with time, giving an authentic aged look to any surface, indoors or outdoors! These new kits have everything you need to transform a cupboard, a planter, or even a small wall into beautiful and natural looking oxidised metal finish. 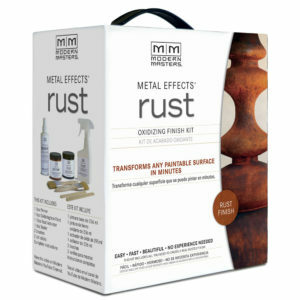 The kits contain a primer, the unique paint and a special activator to speed up the oxidation process! Using this activator, you can create your finishes by taking mere minutes to apply it! The kit also includes brushes and stirring sticks. It really is everything you need in one convenient box! 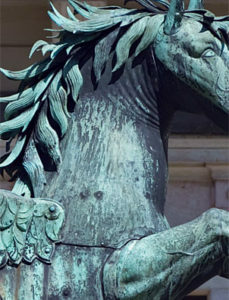 Modern Masters Bronze Paint and Green Activator – A closeup of a recent statue that has antiqued using the paint. Modern Masters Iron Paint and Rust Patina on a tribal statue. 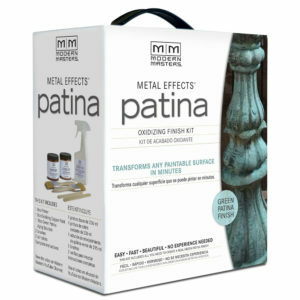 Click here if you’d like to read more about these kits or if you’ve got something around your home that you’d like to give a trendy, aged metal appearance to! 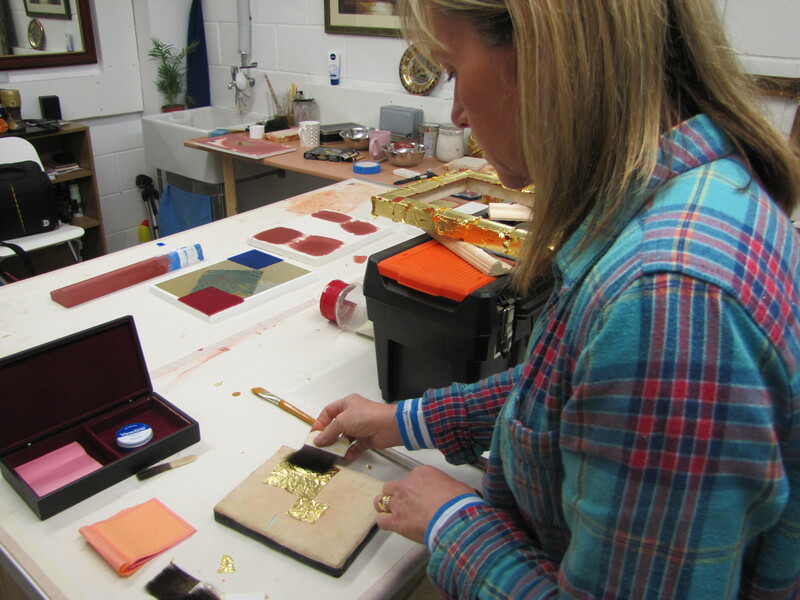 Sue Govani takes a Gilding course with Richard Walker at Watergild Studios, Havant. 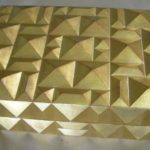 Here at Gold Leaf Supplies we have years of knowledge gleaned from our experience and contacts with gilders and other trade specialists during our forty years of business. 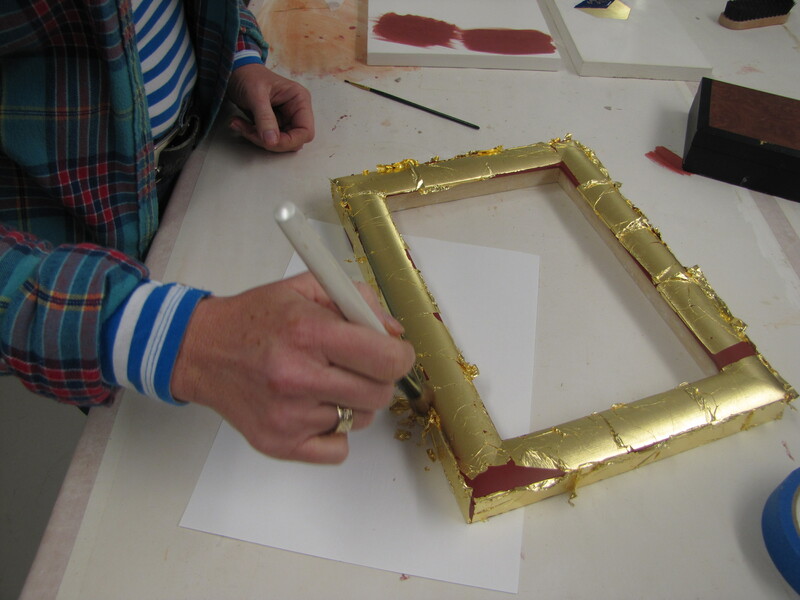 I myself have a background in Art & Design and have completed quite a few gilding projects, mainly glass gilding (verre eglomise) but there was one area of gilding that we have often had people enquire about but had no practical experience – water gilding. 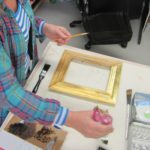 Water gilding is an old technique that, at its most basic, involves laying gold leaf over a surface built up from layers of gesso and bole. 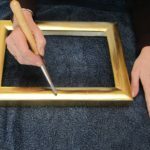 The bole gives a smooth, flexible surface that allows the use of an agate burnish to polish the surface of the gilding to give a bright, mirror finish. 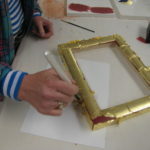 As I found out though, there’s a world of difference between knowing ABOUT water gilding and knowing HOW to water gild! 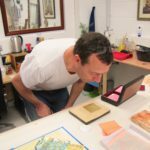 My experience, particularly with all the preparation work that has to be done before you even get to the gilding has left me with nothing but total respect for the artisans who have learned and honed this craft to its utmost. 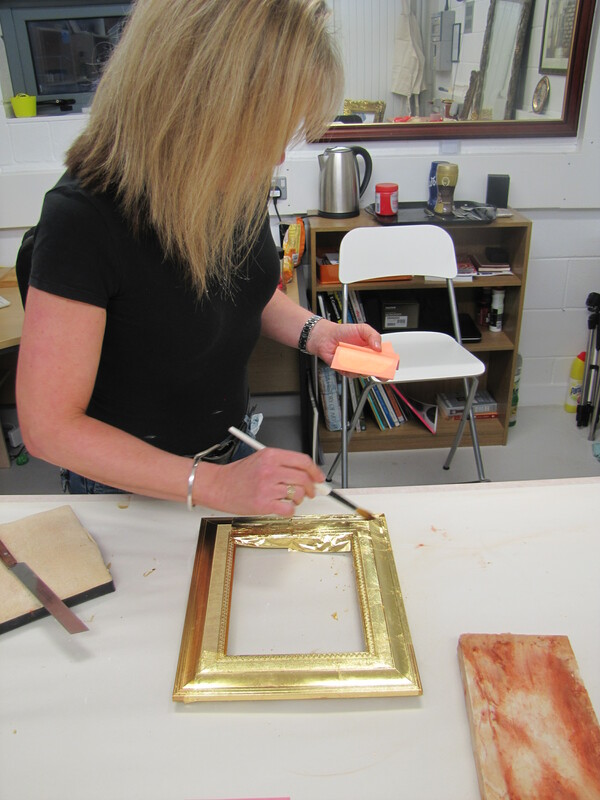 As a total novice to water gilding I needed a great teacher to introduce me to the art, thankfully one of our lovely clients offered to help me out! 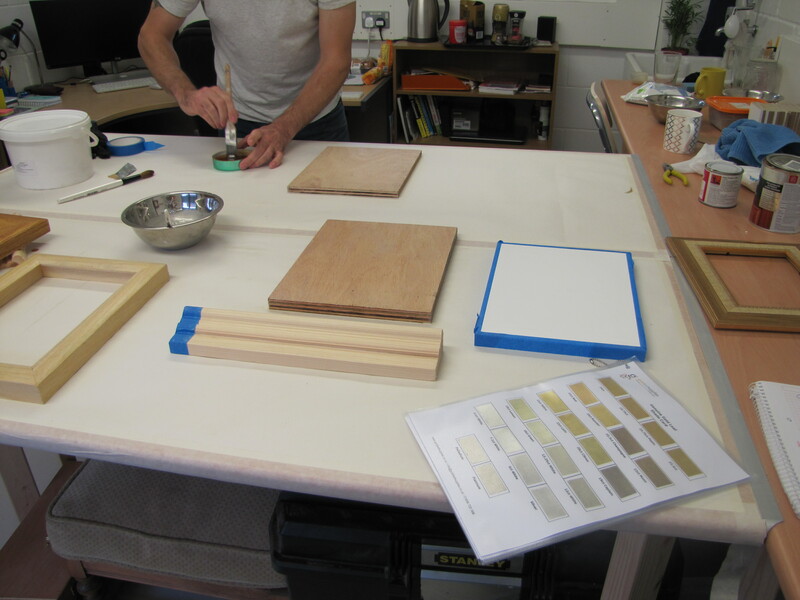 Richard Walker of Watergild Studios is a fantastic gilder and teacher who had offered me one-to-one lessons! Unfortunately our schedules always seemed to conflict and it wasn’t until now after Richard had come back from a wildly successful teaching tour in the US that we were able to meet. 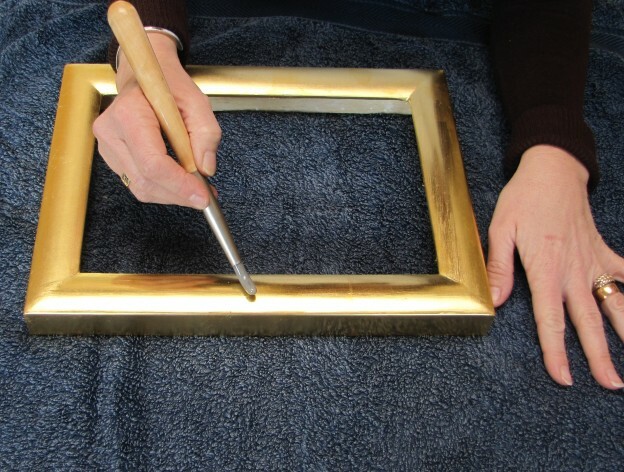 So along to Portsmouth I went, along with some blank frames generously donated by John Mitchell from Robel Framing (http://www.thelatenovembergallery.co.uk/), who had known I wanted to learn to gild for quite some time and put together some frames for me! 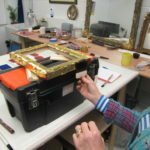 Richard is a natural teacher and a real people person, so easy to get on with and has an incredible knowledge of the gilding and restoration trade and pretty much anything else you care to throw at him! He has a wicked sense of humour and makes the course fun as well as educational! I can see why his courses are such a success. 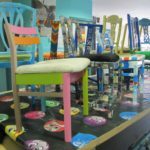 Each year Richard takes quite a large class at the Chippendale International School of Furniture for two weeks and he has some very amusing anecdotes from his times spent there. 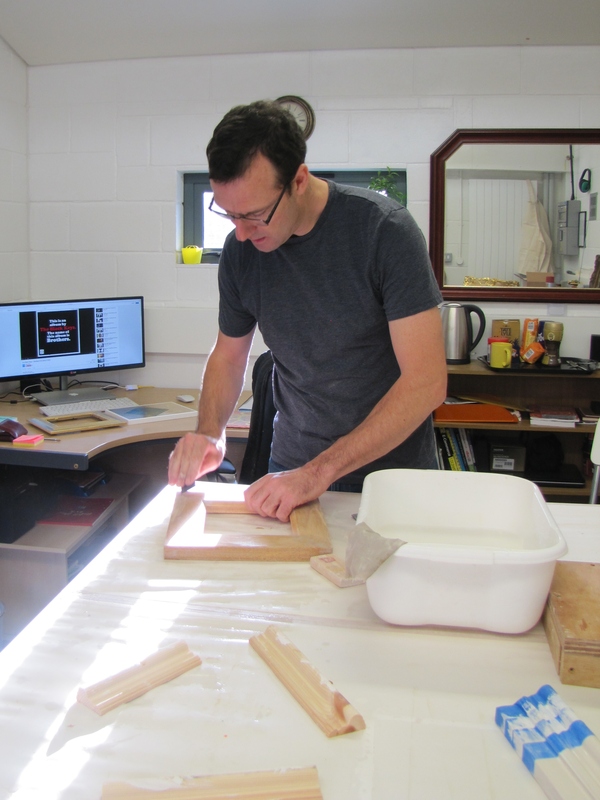 When it came to our course, Richard had the patience of a saint – especially when I said that I wanted to learn everything! 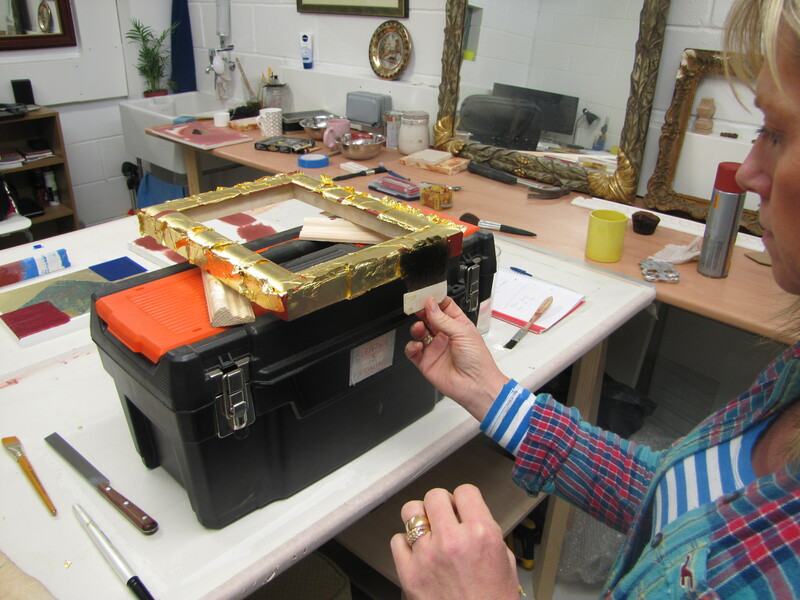 Over the two days I learned so much from Richard, least of all just how much hard graft goes into each and every water gilded piece! 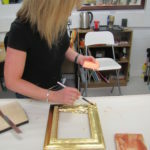 There’s a lot of preparation that needs to be done when it comes to water gilding including layering gesso and bole and Richard didn’t let me off the hook here – I had to apply all ten layers of gesso and five layers of bole by myself to my frame, along with carefully sanding and rubbing back on each coat to achieve a perfect, silky smooth surface. Unfortunately, being a beginner my first tries were less than perfect! Richard helpfully pointed out the ‘dings’, or imperfections, in the surface and sent me away with Wet & Dry paper in hand to smooth them out. 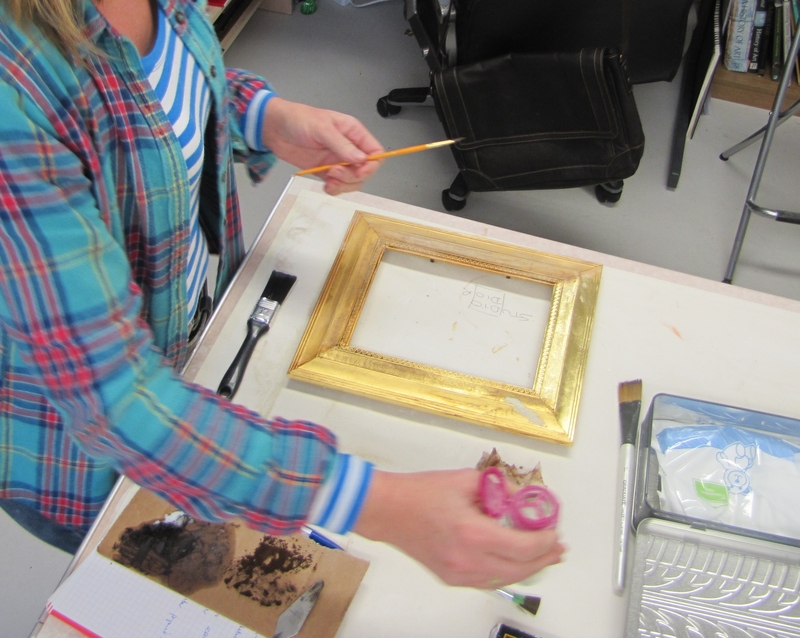 I had always heard and read about how involved water gilding was but it’s another thing to experience it first hand! 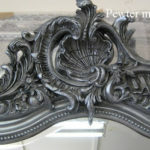 The final finish though is well worth all the effort spent, that gorgeous mirror finish makes it all worth it. 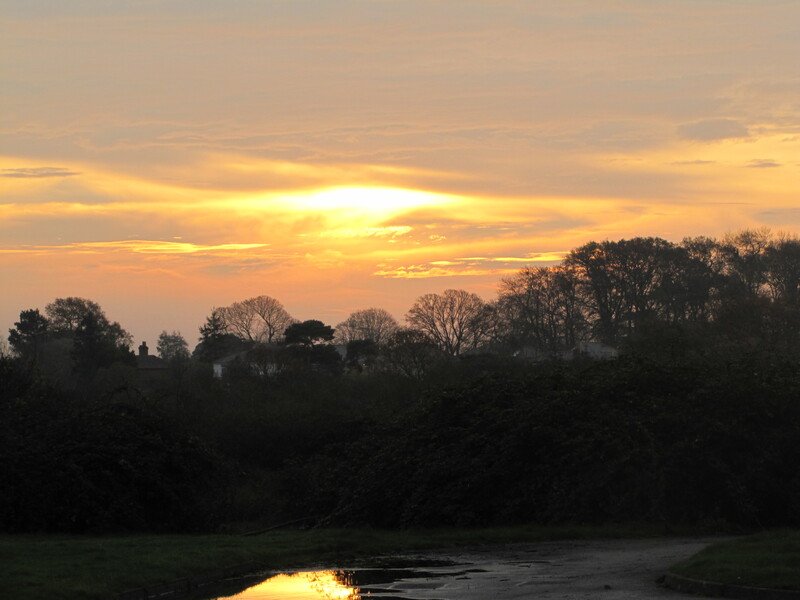 Sunrise outside the hotel, ready for another day of gilding! Another day with no end to the sanding and filling in sight! 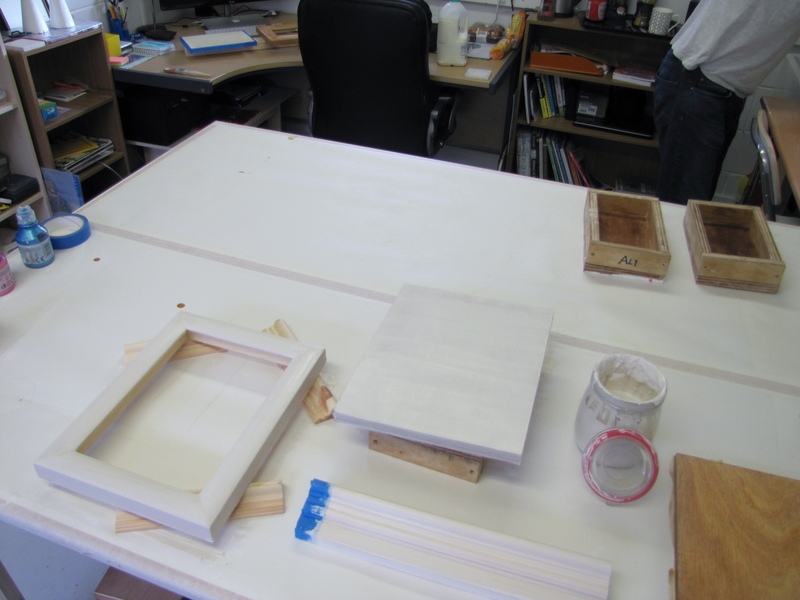 The preparation of the frame swallowed up all of day one and after a restful evening at the Langstone Hotel, Portsmouth, it was back into the studio at 8 am on the Saturday, I still had a lot of sanding still to do if I was going to be able to lay my leaf on the frame later that day! We took a little detour mid morning to a lovely community centre not too far from Richard’s studio where he was offering support in the way of teaching specialist paint techniques to a great group of teenagers involved in the “Strong Voices Project”. 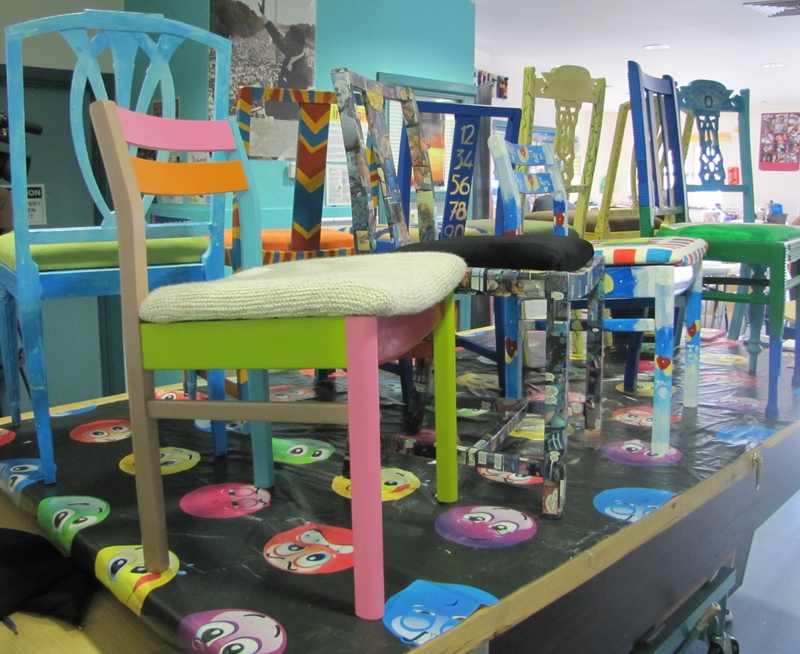 They were incredible young people and had produced some wonderful up-cycled furniture and other items. I didn’t have any time to pick up any of their techniques, I still had too much sanding to do on my frame! Finally, after what seemed like an eternity of a sanding we got to the point that I was finally able to lay the leaf. The whole process has been eye-opening, I had always assumed the most crucial part of the process was the leaf-laying when in fact it’s the painstaking preparation beforehand that contributes the most to the final product. With the gold on the frame it was already starting to take shape but unfortunately my time with Richard was coming to a close! 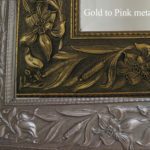 With a few words of advice regarding burnishing, I headed back to Gold Leaf Supplies with my frame and a armful of other samples we’d managed to prepare over the two days – Richard is a veritable treasure trove of knowledge and we somehow managed to find time to discuss and make samples of oil gilding, a verdigris effect created by ageing copper leaf with bleach, ageing and distressing gold and imitation leaf, scraffifto with egg tempera and made a scagliola panel. After a spot of burnishing back home I must say I’m pretty pleased with the result! It’s not perfect by any stretch of the imagination but it’s mine and I spent hours on it! This project was definitely a learning experience and I’m hoping to meet with more of our customers to learn some more ins-and-outs of the trade, so watch this space! Burnishing the leaf onto the bole surface, it’s very satisfying seeing the mirror shine coming up! 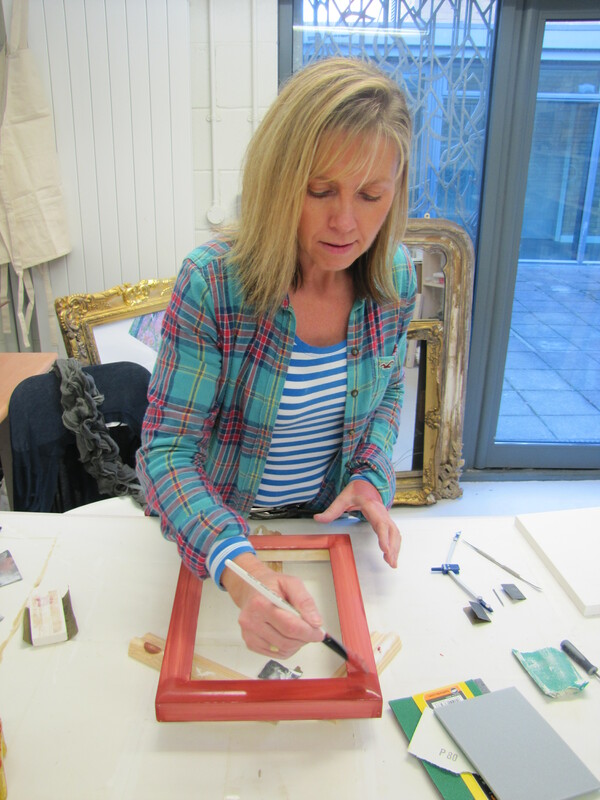 The finished frame – gorgeous, but it needs something inside it! Maybe some verre eglomise…? I feel another project coming on! 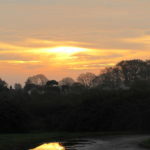 Richard, incidentally, has started on the exciting journey of writing a book – and none too soon in our opinion! 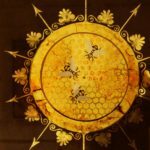 The finished book promises to talk about all areas of gilding, from the historical background of gilding right down to information about the tools, processes, techniques and materials involved. 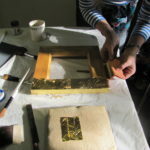 There will also be an assorted range of step-by-step projects in all three disciplines, so that you can fully immerse yourself into gilding and improve your skills as you go along! We wish him all the best with this and are very much looking forward to seeing the book published! 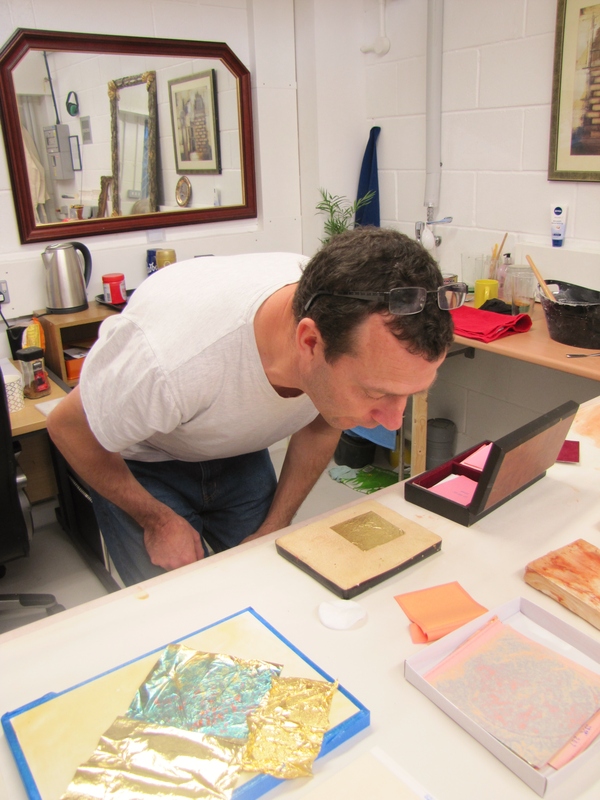 Author Gold Leaf SuppliesPosted on 12th December 2014 16th January 2017 Categories Client Showcase, Furniture, GildingLeave a comment on Sue Govani takes a Gilding course with Richard Walker at Watergild Studios, Havant. Just a quick update here, following on from our ‘How to Create A Bronze Effect Finish’ blogpost a few months back we’ve decided to show you just how quick and easy it is to create something that looks good using just metallic paint, a glaze and a couple of hours! 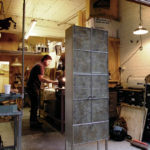 This cabinet was originally a tatty green thing but with just two coats of Liquid Metal Acrylics Blackened Bronze paint the fraying wooden wickerwork has been transformed into a glowing bronze objet d’art! The feet of the cabinet were painted with Modern Masters Reactive Bronze Metallic Paint and then aged with the Blue Patina ageing solution, the contrast between the vivid blue oxidation and aged bronze of the rest of the cabinet makes the otherwise dowdy feet something a point of interest. We chose to go for an appearance of light, all-around corrosion as w only had a little time for this project. 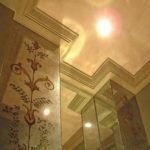 An experienced decorative painter could achieve much more realistic results with the same products. Once the paint was dry we found that the cabinet was a little shiny for something that was supposed to look old and antique. No worries though, General Finishes Glaze Effects in the Van Dyke Brown comes to the rescue! 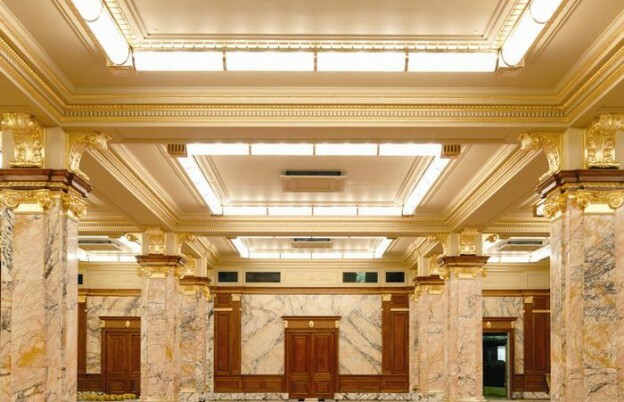 We simply brushed it over the painted surface to bring down the shine, letting it pool in the crevices of the weaving to give the appearance of that patina of age and dirt building up. All-in-all we probably spent about two hours, not including the drying time, in painting this cabinet and I think we can all agree that for the time we put in we got a fantastic result. Now just imagine what you could do with these products! The only item in this picture that is actually metal to start off with is the small vase on the left, everything else including the frame, larger vase and cabinet is a metallic paint effect! 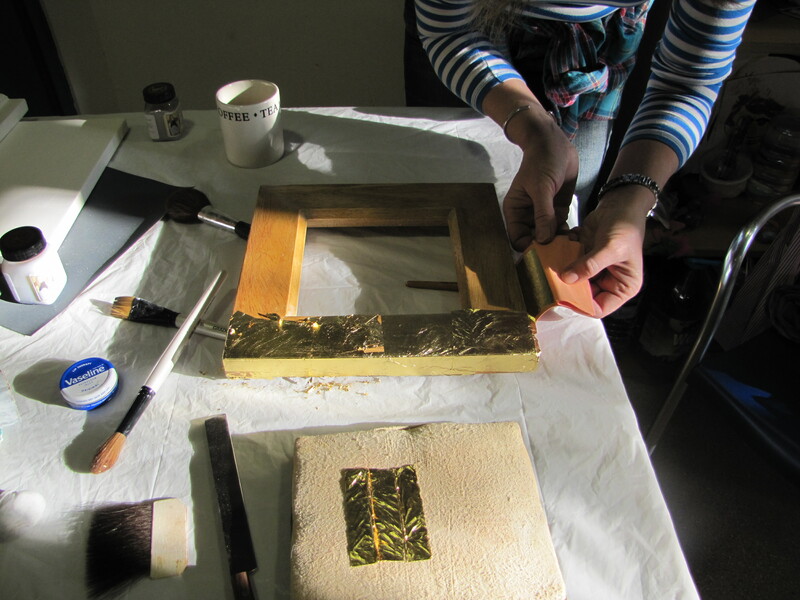 In our very first blog post we featured Emma Peascod, a fantastic artist and gilder who specialises in combining traditional Japanese paper along with verre eglomise to create innovative, contemporary decorative finishes. 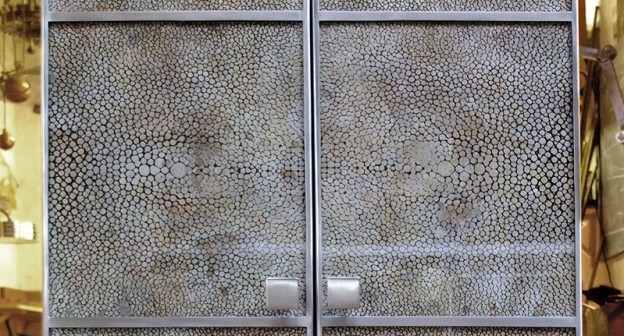 One of these finishes which we also showed off was her gorgeous shagreen finish – a distinctive finish that emulates the pebbled appearance of ray- and shark-hide. Just recently Emma, working together with Simon of Nocturne Workshop, worked to create this bespoke cabinet for a private London residence. 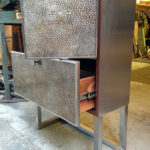 The body of this beautiful tallboy was crafted by Simon – the main frame is solid, oiled black walnut clad in brushed stainless steel and the doors are made from single sheets of steel folded into pans with holes handcut for the glass panels. 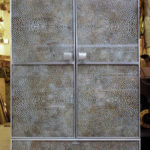 The beautiful glass panels themselves were hand-gilded by Emma using her shagreen technique with variegated metal leaf and bronze powders to produce a finish that compliments the stone flooring in the space it will be installed in. This week we will be focusing on DKT Artworks, an incredibly versatile, well established London based company who offer a myriad of high end finishes within the field of decorative arts. 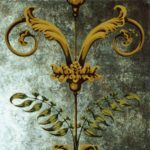 Industrial design, Carving, Gilding, Restoration, Trompe L’Oeil, Textiles, Sign-writing, Specialist decoration, Graphics, Stucco, Bas relief, Paint finishes and a host of other Decorative finishes. Whatever the project DKT can offer tremendous flexibility, from working on-site to finishing projects completely in-house and ready for transportation and fitting by other contractors. They work closely with designers, architects and private individuals to ensure smooth running of the project . DKT boasts a truly impressive worldwide client list and a vast portfolio of completed projects spanning a wide range of venues and disciplines – from painted panels featured on award-winning super-yachts to distressed finishes on the interiors of upmarket London restaurants and bars. 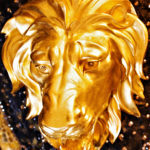 Below we have showcased just some of the gilded decorative artwork that DKT have completed. 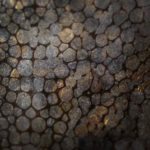 The pictures below are a very small part of their extensive portfolio. 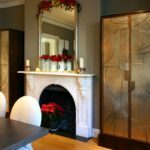 Verre eglomise columns for a London residence, the leaf behind the painting is genuine silver. 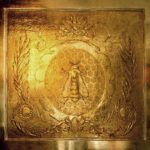 Gilding and glass gilding are just one of the many decorative disciplines that DKT are masters of, below are even more examples of the work they’ve done using genuine gold and silver leaf. A view of the full height gilded silver Verre eglomise columns installed in a London residence. To view more of DKT’s portfolio or if you need details to get in touch with them then click here to visit their website. 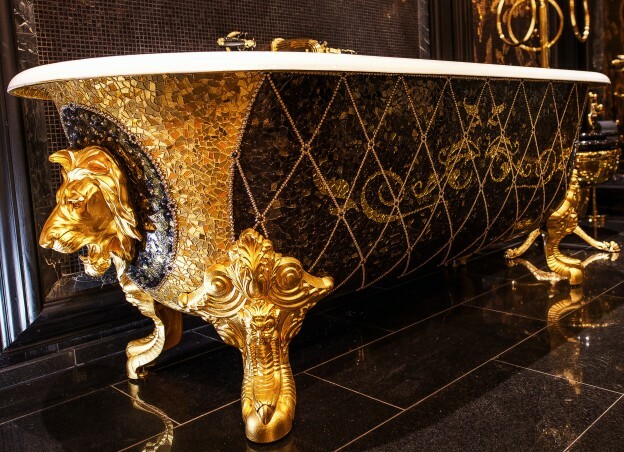 Art meets design with the elegant baths created by Grace of London. Each one can truly be called ‘bespoke’ as they are painstakingly finished with hand-painted, hand-cut pieces of glass that have been gilded in either 12ct, 18ct and 24ct white and yellow gold, silver or platinum, encrusted in sparkling Swarovski crystals and then each piece is coated in a protective resin ensuring a flawless finish. Each piece of glass tile in the mosaic finish was painstakingly hand-gilded and hand-cut in order to create this breathtaking piece. 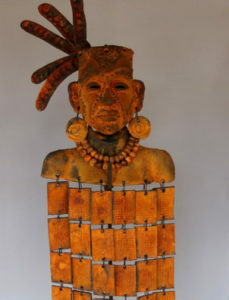 The attention to detail and level of craftsmanship that went into this piece is truly amazing! 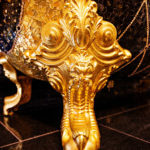 A close up on one of the gilded feet of this truly magnificent bath. 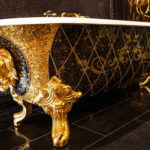 The finish on this particular bath, “The Mayfair”, was created using over 15,000 handcrafted pieces of glass gilded with 24ct gold and then furnished with a trellis of jet and golden shadow Swarovski crystals. It’s a true work of art! 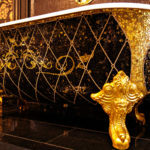 Grace of London specialise in the design and manufacture of unique pieces of furniture like this and their expertise with mosaic and gold leaf designs is unquestionable. 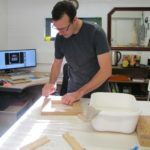 Their team boasts no less than two Royal Warrant holders amongst a host of other truly talented craftsmen and a design team with decades of experience between them, headed by founder and an award-winning craftsman in his own right, Robert James Grace. 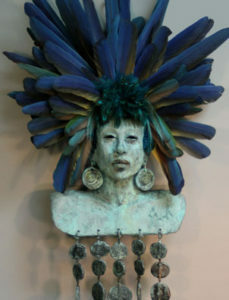 Every piece they create is a signature piece, an extension and reflection of the client it was made for. Working together with designers or architects every detail from the colour to the design of the pieces can be specified to create truly one-of-a-kind bespoke masterpieces, transforming beautiful rooms into spectacular spaces! Alongside our gold leaf and gilding supplies we also offer a large range of products for all sorts of decorating jobs, both interior and exterior but today we’re going to focus on wood and furniture finishing, particularly General Finishes Gel Stains, a product recently introduced to our online shop. 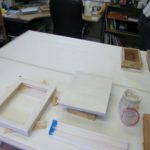 Gel Stains are perfect for finishing difficult woods such as aspen or pine or for up-cycling old or reclaimed furniture. It’s formulation of pigments, oils and urethanes combine to produce a heavy-bodied gel that dries to a durable and lustrous “hand-rubbed” finish. It comes in a variety of colours that can be freely intermixed to create the perfect shade for your project. 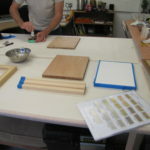 Using Gel Stains to create a gorgeous finish couldn’t be easier, as this guide demonstrates, and our online store has practically everything you need to get started on your first project with them. 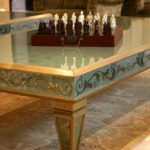 As an example to get your creative juices flowing check out this tabletop finished by Luke Black Ltd, fine furniture finishers and restorers. A newly-made walnut table, distressed and finished by the team at Luke Black Ltd using Gel Stain. 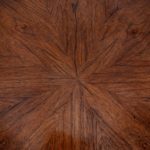 Luke Black and his team are experts when it comes to creating gorgeous finishes on furniture, solid wood floors and internal and external joinery, ranging from the classic to the contemporary. They’ve worked with some of the best designers and clients in the world to create fantastic, high-class finishes tailored to suit their clients needs. 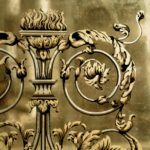 Alongside traditional wooden finishes they also specialise in gilded and glass gilded work, check out pictures underneath for some stunning examples of their work. 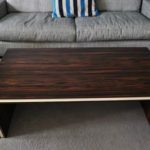 Macassar Ebony & Silver Leaf Coffee Table lovingly finished by Luke Black Ltd. Image Credited to Hugh Gaspar Furniture. A cigar box with a striking, gilded finish. Gilded by Luke Black. While enhancing and highlighting the grain and colour of wood is one way to finish it, another way is to transform it into something else entirely! With Liquid Metals Acrylics you can transform a plain wooden carving into a shimmering golden-looking one – it’s just like alchemy! Liquid Metal Acrylics takes particularly well to wood and can be brushed, rollered or sprayed and is available in a wide palette of metallic shades. 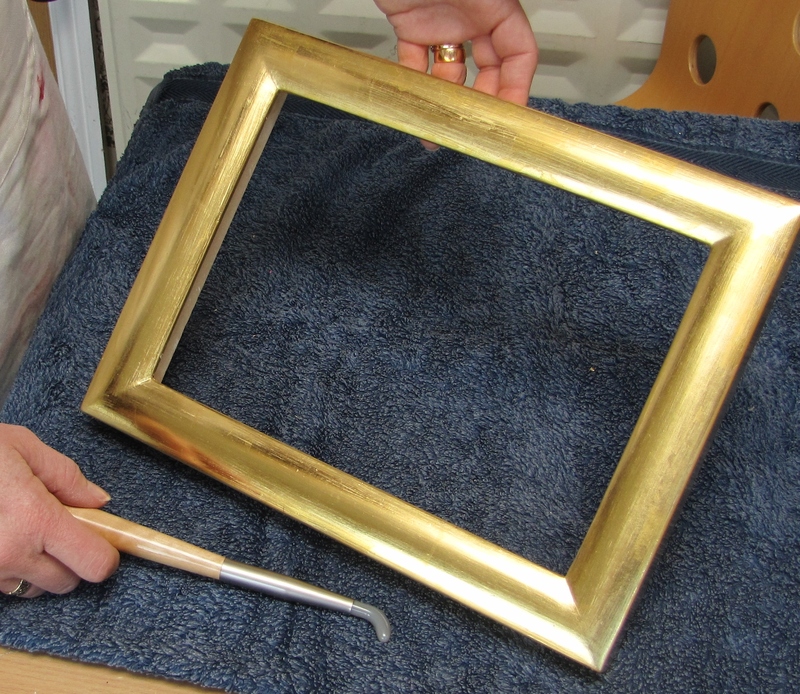 Using Liquid Metal Acrylics Silver Blush this previously golden carved frame has been transformed! 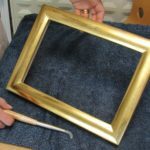 A wooden picture frame that has been overpainted with Liquid Metal Acrylics Pewter paint to create a realistic metallic finish. 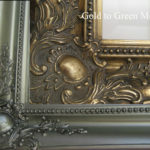 A previous golden picture frame that have been overpainted with Liquid Metallic Acrylic paint to create a subtle silver verde finish. The picture frames above were finished by Claire Lewis. 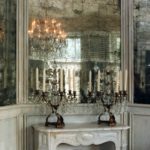 Clare is a gilder and restorer with over twenty years of experience working with antiques and also working alongside architects and interior designers. 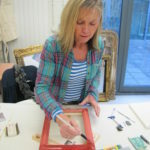 She’s done some fabulous work which you can see on her site – when she says she’s willing to gild anything she means it!